The summer term was a whirlwind of activity for the core team of the National Space Academy, with both Anu Ojha and Sophie Allan involved in teaching and presenting in the UK and Europe. 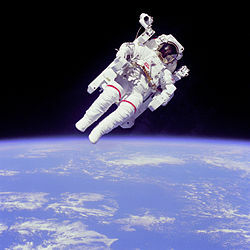 Lead Educators continued to deliver inspiring masterclasses in their regions as well as at the National Space Centre. 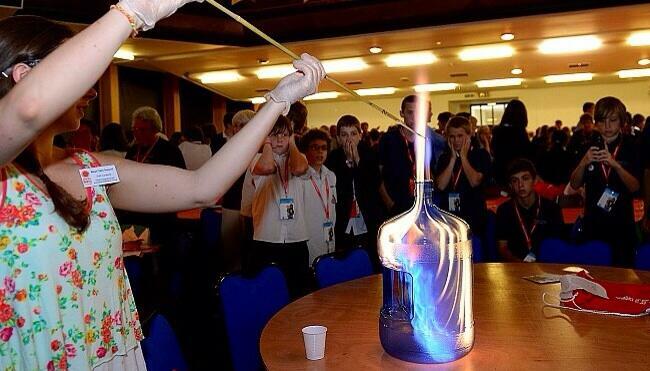 In addition to this the Academy presented and exhibited at the British Science Association's Science Communication Conference in London and the UK Space Conference in Glasgow, building stronger links with educators and industry. The National Space Academy and the National Space Centre are both set to be key partners with the Space Studio Banbury, one of 13 new Studio Schools to be announced today. The National Space Academy's colleagues at Loughborough College have produced a number of promotional videos for the new Higher Apprenticeship in Space Engineering. As well as focussing on current students on the post-16 Space Engineering course, the College have also produced a video in which the Minister for Universities and Science, David Willetts, discusses the launch of the Higher Apprenticeship and its goals. We Are Aliens, the latest planetarium show produced by the National Space Centre's in house designers and animators at NSC Creative, was launched towards the end of 2012. Alongside the development of the show, NSC Creative worked with National Space Academy Lead Educators to develop classroom resources, including video clips of experiments, based around the science of We Are Aliens. These resources for physics, chemistry and biology are all available online. Last Friday saw the official launch of the Higher Apprenticeship in Space Engineering, a framework developed by the National Space Academy in collaboration with Loughborough College and Leicester University. 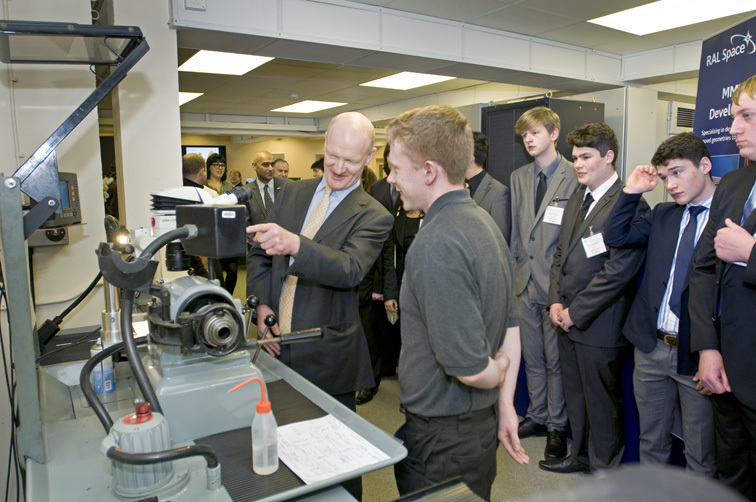 Science Minister David Willetts joined the first cohort of the Space Engineering post-16 course at RAL Space to talk to existing STFC apprentices and young people interested in joining the UK Space Sector through the apprenticeship pathway. The European Space Agency (ESA)'s dedicated Education channel on Youtube has released a film highlighting one of the National Space Academy teacher masterclass held at ESA's space engineering technical centre (ESTEC – Holland) as part of ESA's 2012 Summer Teacher Conference. The National Space Academy is very sorry to say goodbye to Dr Sarah Hill as National Project Manager after nearly 5 years of dedicated employment. Sarah is leaving her Academy role to become a Regional Director with STEMNET, continuing her excellent career in STEM support. The role of National Manager will now be taken on by Dr Kierann Shah, formerly Regional Project Manager for the National Space Academy. Last year Caroline Molyneux, one of the National Space Academy Lead Educators, gained a place on an exciting European course. 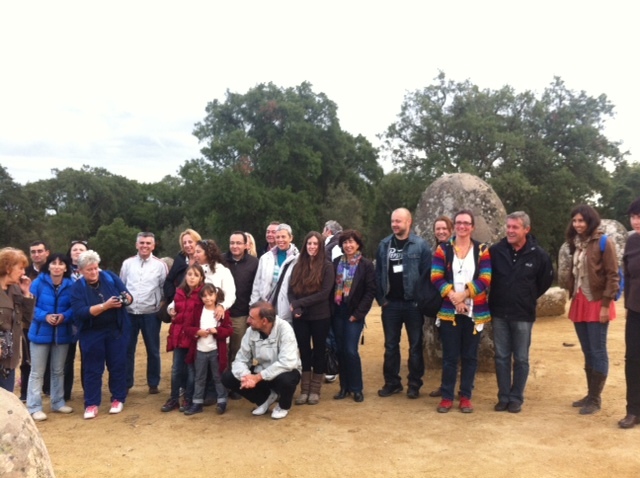 The following is her account of working with teachers from across Europe for one week last October. Conor Davies, one of the National Space Academy Lead Educators, led two days of masterclasses for students from four Leeds schools. David Young Community Academy, Roundhay and Lawnswood Schools, and the Grammar School at Leeds (GSAL) all gave Year 9 pupils a chance to get involved with the National Space Academy activities. As a finale on the second day, Mr Davies used a number of ingredients, some which might surprise you, to whip up a comet nucleus. National Space Academy Lead Educator Robin Mobbs visited a school in Baldock recently to talk about physics and space exploration. One of the students he taught has written the following report on the day.